Four weeks is a long time. Unless your team’s on a winning roll, and you want to savor every moment. “The last games went by in a blink of an eye,” says sophomore catcher Trevor Edwards. Before the baseball season, Coach Mike Gaski explained that they would play small ball. With an NCAA rule change dampening the “trampoline effect” in the metal bats, it’d be harder to hit home runs. What would have reached the fence last year would be a long fly out this time. This year, moving your teammates into scoring position and then finding a way to get them home – one run at a time – would be key. They finished the regular season 34-18, 22-8 in the SoCon. They led the nation in sacrifice bunts, with 88 – five ahead of the next-closest team. The steals percentage was impressive. And on defense, they finished the regular season ranked 27th nationally, at 0.975 percent. But one day in March, Gaski recalls, as weather was warming up, they were doing their “super-Spartan drills.” This is where they run through plays again and again, honing fundamentals and teamwork. For example, what if the ball rolls into the no-man’s land between the pitcher, first baseman and second baseman? Those three positions go through that drill again and again, so in a game it all goes like clockwork. All the players were doing similar drills for their respective positions. The team collectively had an epiphany that afternoon, he says. “Holy smokes! We can do this.” They were really good. They began better executing the fundamentals in games. The pitchers knew they didn’t have to get a strike-out; a grounder would be handled. Fly balls would be snagged. Outfielders would hit the cut-off man, who’d make a great throw. And when at bat, they forced the opposing pitchers into high pitch counts, inning after inning. All the while, they worked on their bunting. “Lots of bunting,” says Edwards. The last games went by in a blink of an eye. Because they sacrifice bunted so much – giving up the batter so the man on base could advance – they put runners in scoring position a lot, Gaski explains. They were buying into it all as a team, Gaski says. They trusted each other. They trusted what the coaches were teaching. They believed. Over the course of the final 16 games, they won 15. They came to believe if it was close in the seventh inning, they’d find a way to win it. They won two of the three games against eventual regular season champion Elon, and nearly caught them, finishing second. Gaski was named SoCon coach of the year. 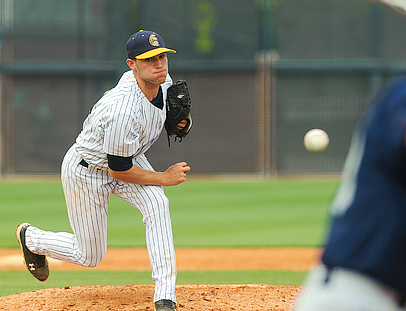 Edwards was first team All-SoCon, as was pitcher Warren Slack. Pitcher Brandon Browne was named All-Freshman. The team finished the regular season ranked 16th nationally among mid-major programs. Asked to describe the team in one word, he said “Believers.” They had each other’s backs.